Bridger and I had a blast fixing up one of the diaper boxes we had sitting around. 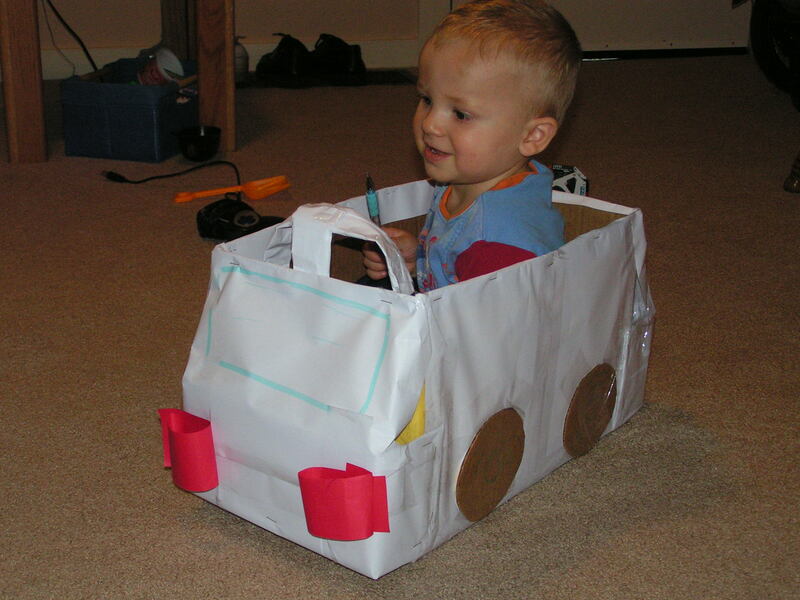 All you need is 1 diaper box, some crayons and markers, about 13 pieces of 8 1/2 X 11 paper, scissors, and packing tape. 4. Cover the two longs sides of the box, and the two bumper pieces with paper. Attach the two bumper pieces. 5. I taped a piece of paper on each side to form a front and back windshield. 6. Color and attach the four wheels, and then decorate the car. 7. I made a steering wheel using 3 pieces of rolled up paper. I also did the front and rear lights using rolled up red paper.